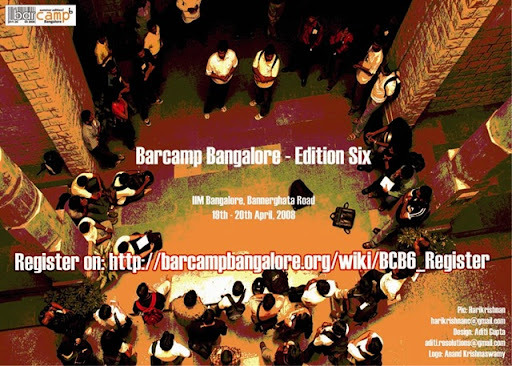 The barcamp movement has taken India by storm and Bangalore has now become the center of this movement in India. 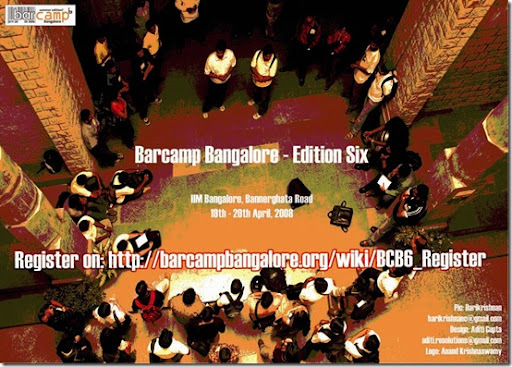 I think it was Barcamp Bangalore where it all started and now its in its 6th edition. I was introduced to it in the 4rth edition. I liked the concept at the very first. It was very clear that everyone is equal. You would be admired based on not what you are but what you deliver. So if someone is talking crap, you can just walk out. True there were a lot of freeloaders out there who came to do nothing actually. I was supposed to be one but then I realized that I too could talk. Well not technical but the I could speak about "How the bloggers are affecting other professionals". I thought this was the beauty of Barcamp. You could discuss anything under the sun. When the next barcamp was being planned and call was made for other to chip in, I decided to go ahead for it. Sadly I could not attend the Barcamp because of personal reasons but I could not attend it. This time around I am also trying to chip in to help have barcamp this time around too. Not much of thoughts about whats ideal but yes in terms of if there is anything that can be done, I would like to be there. Actually I am a firm believer of the fact that if there are too many cooks spoil the broth and I am happy with being a supporter. That apart the fact is that there are really passionate people who actually work towards making barcamp a success, there are also people who are crying on the blogs and not doing anything. For me if there are a couple of ideas that discussed which stimulate my mind, thats enough for a camp because frankly we Indians are not mature enough to have tens of geniuses come for barcmap and talk about the next C, Java or next big kernel architectures. Having said that, we definitely have the knowledge of whats going around and thats cool enough. Even I plan to have a session so that I can find some people to start with building a nice open source offline blogging tool or Buddys Here. I hope I do find some interested people. Hoping for a nice time at barcamp. But as this event is by and for the people, are you going to make it happen?